Raul Madrigal stares and extends a defiant middle finger, apparently at feds hunting him. Raul Madrigal stares and extends a defiant middle finger, apparently at feds hunting him.“He is kind of taunting us,” said Brian Ritchie, who leads the violent crimes and gangs task force for the FBI's Houston division, which has been trying to capture him for months. 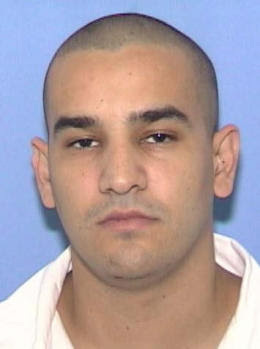 Authorities contend Madrigal, 29, is a key member of the fast-growing Tango Blast — the largest gang in the city — and that from 2007 to 2009, he helped the Gulf Cartel pump millions of dollars worth of marijuana and cocaine into Houston and the surrounding area.Fleeing to Mexico follows a Texas border crime tradition, but also speaks to what Washington sees as a growing threat posed by partnerships between Mexican drug cartels and U.S. gangs.Assistant Attorney General Lanny Breuer testified before Congress last week that the Department of Justice plans to step up investigations of the ties as part of a strategy similar to what was previously used to take on the mafia and other international syndicates. Madrigal apparently made so much money that authorities intend to seize $18 million in assets in the case against him and 13 other defendants charged with trafficking under Operation Broken Star.They've already seized nine of Madrigal's bling cars, including a Bentley sedan, two BMWs and two Maseratis. All look showroom clean and remain parked in a heavily secured storage facility until they are sold at auction. A 6.5 carat diamond ring also was taken as drug proceeds, as was a customized three-wheel T-Rex motorcycle, complete with ostrich-skin seats and an LCD monitor. Authorities won't say whether they expect to see Madrigal in handcuffs anytime soon but note he's likely in a dangerous country where he can't stand alone. “He has probably aligned himself with some people who offer the protection he deserves and has earned,” Ritchie said.In Houston, the conspiracy is alleged to have started months after U.S.-born Madrigal was released from his second stint in a Texas prison, where agents speculate he reinforced dubious connections. Authorities said Tango Blast is an appealing partner for traffickers because it has many members and is spread out across the state. Other more traditional Latino gangs, such as the Mexican Mafia and the Texas Syndicate, also work with the cartels, according to a recent law enforcement report. “People are so worried the cartels are going to come over here, but they have these people at their beck and call,” said Pat Villafranca, an FBI spokeswoman in Houston.The cartel has the drug supply while the U.S. gangs know the streets, have the contacts and can blend in.“They get these guys to do their dirty work,” said Rick Moreno, a Houston police homicide investigator who has mapped out local gang connections to cartel murders, kidnappings and other crimes. Among others charged in the conspiracy is Saul Salinas, the brother of a trafficker gunned down here in 2006. The case was recently solved and the suspects await trial. “Madrigal hooked up with all these people he met in prison and out of prison,” the FBI's Ritchie said. His biggest connection was Mario Gonzalez, an accused cartel member and fugitive. Madrigal is charged in a conspiracy to move at least a ton of weed, but he is believed to have used a network of stash houses to sell about 5,000 pounds a month, enough to roll more than 3 million joints every 30 days.Even if Madrigal, who has a list of prior criminal offenses, again sees a courtroom, there is no guarantee of conviction. Four times he's had charges against him dismissed, and he wasn't charged in the death of a rival killed in a shootout. He was convicted twice and went to prison, once for theft and again for drug dealing.In the meantime, Madrigal's taunts give authorities motivation, said a veteran state law enforcement officer. “Old-school gangsters ... would never draw attention like that,” he said.